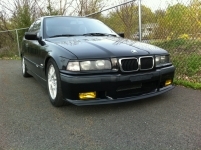 It was a standard LTW wing for an E36 sedan that the body shop custom fit to the Ti hatch. A couple interior shots added. Is this car still for sale? If so, pm me your phone number. I'm an active member on m3forum.net but just made an account over here so I can't pm yet. Or can I not receive PMs yet either? Last edited by werfer; 11-07-2017 at 08:33 PM. Updated with undercarriage pics. PPI inspection showed car is in great shape and ready to roll. Basic maintenance of oil change, plugs, valve cover gasket, and cooling hard line were just completed. I’m not sure if my PM actually sent? I just created an account so i could message you because I might be interested in this car. Turner, I received your PM however I am guessing you don’t have enough posts to receive PM back as I was unable to reply. Can you post your number or email so I can get ahold of you?